Q1. Company name as registered with ATO Does not fit in RAB Legal Company information field. Enter as much as you can fit into the field all capitalised. Then open Cloud Govconnect, go to company & adviser info, click the pencil icon like below, to enter the company name, make sure it matches the one you have entered in RAB file exactly. And it is case sensitive. However, if you are using Payroll Premier, please note your legal company name must be less than 50 characters. Please see KB http://kb.reckon.com.au/issue_view.asp?ID=5683 for more information. 11th employee in their list does not have an email address set. Go back to the employee list and enter the correct email address and try exporting the file again and Upload it. Q3. Getting error �Invalid company Information provided. Please check your ABN/WPN, Company name and Branch Number match those set in Reckon GovConnect Single Touch Payroll for your company. The error comes when your legal company details do not match the details you have in GovConnect Portal. New GovConnect Portal pulls the legal company name information from the ABN Lookup and it must match the legal details you have in your company file. This Information are case sensitive. � Branch Number. Enter 000 if it is blank. Q4. Can I lodge STP for two companies having the same ABN. There are two company files having the same ABN. If Both files are for same ABN and have Same branch number, and you have just created two separate company files to create a different group; you will just use the same Company tile in GovConnect window to lodge STP for both files. However, if they are two separate branches, with different branch Number but same ABN, you will have to create separate company tile in GovConnect STP. And submit STP using the respective company tile. Q5. Why does Payroll Premier export 2 json files, and does it matter which one you use? Use the file named STPEXPORT.JSON for your submission to ATO. The other file is just a duplicate copy and is for your record keeping purpose, as it has the date and time stamp as a file name, indicating when it was created. The STPEXPORT.JSON file gets overwritten with the new file, on every new payrun. Q6. Why do I receive an error message stating, 'The request is valid, but the pull request is yet to be queued' when I submit my Single Touch Payroll (STP)? You may receive this message when the ATO are experiencing extended processing times. Please check back later and your status should update to either successful or a message that requires your further attention. Q7. Why am I getting the message �Please contact the tax office" - Single Touch Payroll? If you've just submitted your STP file and receive an error message advising to "Please contact the tax office", the most common reason for that is because your Software ID from GovConnect STP has not been registered with the ATO. Check out our Single Touch Payroll AUSkey and Software ID FAQ page for full info how to register your Software ID. Please note: For Reckon Accounts Hosted users, you will notice a Software ID listed inside Hosted itself, this is separate and not related to Single Touch Payroll services. 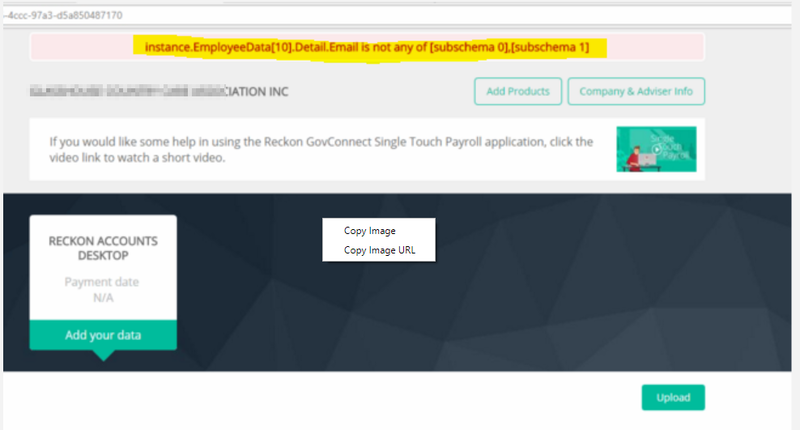 Please do NOT use the Software ID listed inside Reckon Accounts Hosted itself for Single Touch Payroll, only use the Software ID in GovConnect STP. Q8. �Invalid Company Information error� in GovConnect STP when submitting pays from GovConnect. Q9. Do I need anAuskey to use Reckon GovConnect? Only time you require a business or tax agent auskey to use Reckon GovConnect is to register the Software ID with the ATO- if you are doing this with the ATO access manager. If you do not wish to use Auskey, you can call the ATO to register your Software ID. The phone number is 1300 852 232. You will need Reckon Limited�s ABN which his 14 003 348 730 and the Software ID which was generated in your Govconnect application. Q10. How can I register my software ID to ATO? Q11. 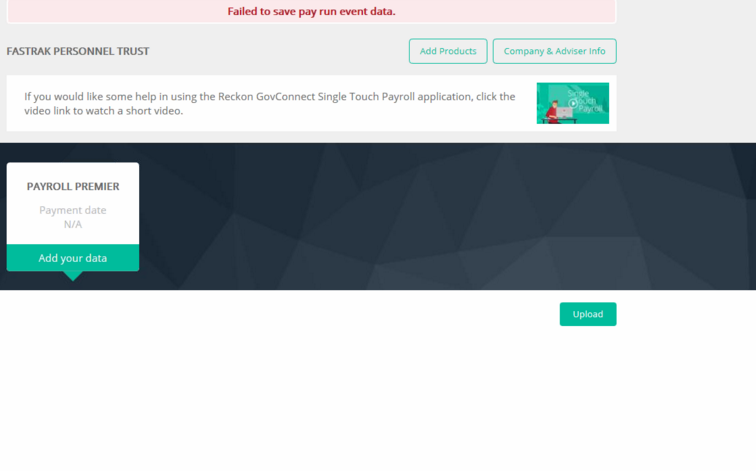 Getting �Failed to save pay run event data� error when uploading the STP report file to GovConnect. This error is generally due to a corrupt JSON file (STP file) mostly as a result of use on invalid characters in the upload file. This could be like, use of double Quotes in address eg, �NorthSydney�. Etc. Q12 Why am I getting the error, �instance.PayrollEvent.PayrollDetails requires property �TotalGross�, instance.PayrollEvent.PayrollDetails requires property �TotalPAYG�� when trying to upload the STP files to Reckon GovConnect STP portal. The error occurs when you have exported the STP file as an �update event� from Reckon Accounts and uploaded to the STP portal as �New Pay Run / Full File Replacement� option. You will have to export the STP file as an �Update a previously completed ATO submission� option instead. Please see KB for more information.